Portugal take on Germany in Group G early Tuesday morning. 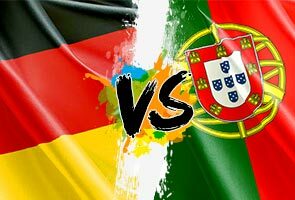 RIO DE JANEIRO: Cristiano Ronaldo's Portugal aim to end a run of three defeats by Germany in major tournaments when their World Cup clash takes centre-stage Tuesday. Ghana play the United States in a second Group G game, while in Group F, Iran take on Nigeria. Germany beat the FIFA Ballon D'Or winner's side 3-1 in the third place playoff at the 2006 World Cup, 3-2 in the 2008 European Championships quarter final and 1-0 in the first round of Euro 2012. Other statistics weigh against Ronaldo as Germany have won all of their World Cup opening matches since 1990. Germany had a number of injury doubts going into the much awaited encounter in Salvador, starting at 1600 GMT. But goalkeeper Manuel Neuer will return to duty after overcoming a strained shoulder. And midfield star Bastian Schweinsteiger will play even though he was helicoptered to a hospital on Saturday for a knee scan at FIFA's insistence, the German FA said. The 29-year-old Ronaldo is on a high having won the Champions League with Real Madrid. But he has been training with a heavily strapped knee in recent days. A Ronaldo below 100% would be a major blow to Portuguese hopes, but he says he is raring to go. "I have been practising for a few days, which I couldn't do if I was injured," Ronaldo said on the eve of the game. "I'd like to be 110 percent, but I am at 100 percent and ready to help the national team." The United States and their German coach Jurgen Klinsmann also have points to prove in their game against Ghana in Natal, starting at 2200 GMT. Ghana beat the United States at the last two World Cups. And Klinsmann, who won the World Cup with Germany as a player in 1990 and coached them to third place in 2006, wants the US side to shake off their outsiders ranking. He has, however, faced criticism for not choosing Landon Donovan, the all-time top scorer in Major League Soccer. The German insists the United States can challenge the group favourites. "No matter what the circumstances are, no matter how our game goes, this group is ready to go the extra mile to make it happen tomorrow," said Klinsmann. "We just want to show that we've prepared the best way possible, we've worked very hard and we'll take that confidence into the game because we know we've done a very good preparation." Ghana skipper Asamoah Gyan believes his young side will get a new victory. "They're coming for revenge. Mentally they don't want us to beat them for the third time, so it's going to make the match very difficult," said Gyan. "The USA are a good side, they're a very dangerous team. But we think of ourselves first. We've got young, talented players who are coming up and playing well in their clubs. They're in great shape." Nigeria go into the World Cup as African champions aiming to improve on a disappointing past record of two points from six matches at two previous World Cups. They face an Iranian team, in Curitiba at 1900 GMT, who had a troubled cash-strapped buildup to the tournament but have a canny coach in Carlos Queiroz, the former Portugal boss. Nigeria coach Stephen Keshi said that Queiroz "is their biggest weapon, because he's well experienced, he knows the game well." Nigeria will rely on Chelsea's John Obi Mikel and goalkeeper Vincent Enyeama. Queiroz has called on 11 foreign-based Iranians to boost his squad, but insists all will play their part. "We will have 90 minutes to fight against Nigeria and one thing for sure is the Iranian players are willing to give 100 percent and work hard to get results," said the Portuguese.